[JM] Illustrator or author/illustrator? Or. . .
[JC] Graphic Designer, with an emphasis on illustrated books, with over 30 years experience in the book publishing industry. In addition, I’m also a children’s book illustration instructor, doing it both in person and on-line at UC San Diego Extension for the past 7 years. [JC] Born in NYC, raised in the Bronx. I still have residual NYC reactions to things I adore, and situations I find intolerable. Californians are far more even-tempered in contrast. I figure that’s why I’m passionate about what I do. [JC] There were three pivotal moments in my life. When my mom would encourage me to draw on paper — after discovering I had covered our apartment walls with crayon drawings, at age 3 — and she’d give lessons besides, alongside reading Golden Books aloud. We learned reading English together. Soon after, my dad made sure I always had fresh blank notebooks plus plenty of pencils handy to draw up stories inspired by Life magazine, which I could never get enough of. Provocative details to pore over, plus many photographs to copy and sketch variations from. Then there was the day I was issued my first library card at age 7, from the New York Public Library (NYPL). Pure magic! I could possess up to twelve beautiful books, at home for 4 whole weeks! It sparked my love for illustration. O the places those books transported me, outside of the south Bronx! I became aware early on which publishers produced the books I loved most. Any Viking picture book I’d stumble upon was coveted. Harcourt Brace produced my favorite middle grade novels — they were all illustrated! As I progressed to wordier fare, I’d notice that some books even gave a history of its text font on the last page. I didn’t learn until much later that bookmaking would combine my love of art, design, and story into a single career. [JC] I still love drawing. Good drawing is the foundation for learning how to see. I had every intention of becoming a children’s book illustrator. After college, I was hired as a design trainee at the adult trade division of Alfred A. Knopf, mentored by the legendary art director Betty Anderson. Knopf has a reputation for quality literature and good bookmaking. I was hooked on typography, layout, and the craft of book design ever since. I loved working with artists. I also grew to love working on a Mac. More magic! [JM] Joy Chu Designs is a multi-disciplinary design studio. What does that entail? [JC] I design books of all genres. I art-direct and style all manner of photo shoots. I create websites and videos, and designed campaigns and graphics that invariably tell a story. I also coach artists one-on-one, or in groups, helping them to identify the path of least resistance. That is, what comes naturally, and to pursue it passionately. It all involves story, one way or another. [JM] Tell us a little about Got Story? [JC] It began several years ago as a public Facebook page, for my UC San Diego Extension students. Extension didn’t utilize on-line software then. I felt students needed a place to sustain the enthusiasm about picture book finds beyond our weekly classroom meetings. Then some of my own Facebook friends — many of them colleagues in the book biz — would spot postings of their own favorites, and offer observations. Melanie Hope Greenberg liked it so much, she offered to participate in a Q and A exchange, which spun off into a blog [gotstorycountdown.wordpress.com], because we did it like a David Letterman-like “Top Ten” — with one question or topic per day, with the final question being number one. I discovered that I much prefer the spontaneity of the Facebook format. Blogging takes way too long! That’s where it’s been ever since. Students can mingle with some of the best picture book practitioners in the business quickly and informally. Picture book people are a unique group of talented, big-heart folk. I love the field. [JM] I know you are super busy curating a museum show for the CCA Escondido. The dates are July 11-Sept 13. Please tell us more about this. [JC] Leah Goodwin of the California Center for the Arts knew there was a hot bed of published picture book creators in our southern region of California, and wanted to hold a show that highlighted children’s book illustration to the community at large. How would she get in touch with the right people? Janice Yuwiler, SCBWI San Diego Regional Advisor, immediately introduced us via Facebook! Leah and her team are dynamic! Stella Karl has been a whirling dervish, corralling and organizing the mounting of all the works, coordinating the overall design layout and approach. We’ve reviewed color choices, typography, and content. Kirsten Vega orchestrated a Student Art Competition based upon the theme of the exhibition, telling a story with pictures. Winners will be on full view at a dedicated gallery, professionally displayed. I am blessed to be Guest Curator for such a world class venue! We will be showcasing over 50 artists and writers, displaying not only original art, but preliminary sketches, spreads from dummies, and thumbnail storyboards as case studies. Students of children’s picture books will have a blast, perusing the stories behind the making of the book. Rafael Lopez is one of our local treasures. He is lending us his original drawings — you can see decision-making on paper — from his latest work, Drum Dream Girl, (written by Margarita Engle) alongside his dreamy paintings. I’ve been a long time admirer of his work, and I feel he has produced his best work yet. A Caldecott contender! The sheer variety of art media alone is astounding. Lisa Brown is lending us gauze fabrics and stained papers she used as the textures throughout her Mummy Cat book (written by Marcus Ewert). Antoinette Portis shares her many scraps, pointing out where we can find them in her final art (from Wait). And Salina Yoon staged a re-creation of her art studio, with drawings hanging on walls, and on a small drawing table. Visitors will be able to sit in her chair! We even have sneak previews of books not yet out. Enlarged graphics of characters from Marla Frazee’s upcoming book, Is Mommy? (words by poet Victoria Chang) due out November 2015 will be appear on walls lifesize, throughout the exhibition. Drawings from Salina Yoon’s upcoming January 2016 release, Be a Friend, will be revealed, along with its trailer, an exclusive! Other marvelous book trailers by our exhibitors will be shown on a large screen, in a continual loop, in an adjoining gallery. So inspirational, all of it. [JM] What artwork do you have hanging in your house? [JC] I hang very little, actually. Except for reminder Post-its and To-Do Lists. My walls are all painted in bright colors though! Everyone always remarks on them when they visit. [JC] I have several! So far, I’d say Central Park (NYC); Golden Gate Park and the Presidio (S.F. ); Stanley Park (Vancouver, BC); Victoria Peak Garden (Causeway Bay, Hong Kong); the California side of Lake Tahoe during the winter months. [JM] What word best sums you up? [JC] I’m fascinated by Scotties (aka Aberdeen Terriers). [JC] Fresh brewed green tea. Enjoyed with a small square of dark chocolate, 50% cacao, nibbled slowly. Sheer heaven. Plan B: A huge, juicy, freshly-peeled naval orange. 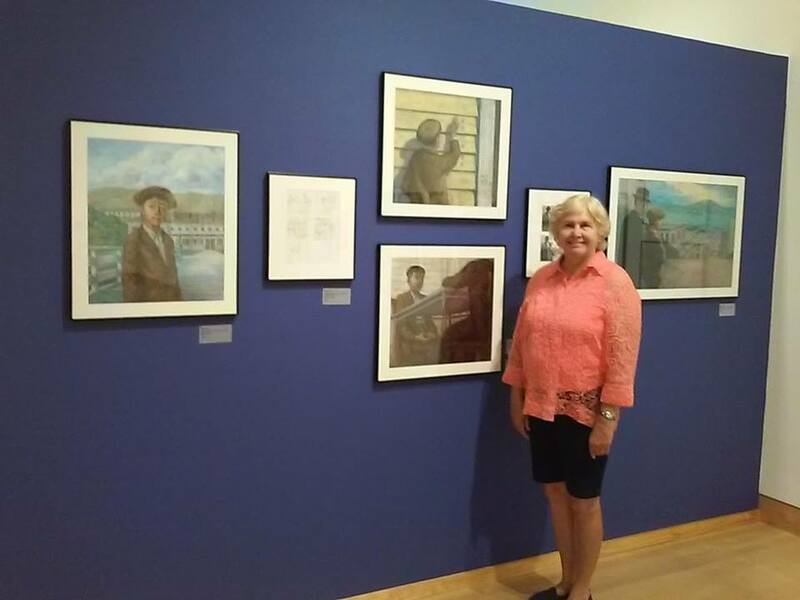 Helen Foster James, co-author of Paper Son (with Virginia Loh-Hagan), stands alongside Wilson Ong‘s paintings from their book.